The Senate of Canada (French: Sénat du Canada) is the upper house of the Parliament of Canada, along with the House of Commons and the Monarch (represented by the Governor General). The Senate is modelled after the British House of Lords and consists of 105 members appointed by the Governor General on the advice of the Prime Minister. Seats are assigned on a regional basis: four regions—defined as Ontario, Quebec, the Maritime provinces, and the Western provinces—each receive 24 seats, with the remaining portions of the country—Newfoundland and Labrador receiving 6 seats and the three northern territories each assigned the remaining one seat. Senators may serve until they reach the age of 75. While the Senate is the upper house of Parliament and the House of Commons is the lower house, this does not imply the Senate is more powerful than the House of Commons. It merely entails that its members and officers outrank the members and officers of the Commons in the order of precedence for the purposes of protocol. As a matter of practice and custom, the Commons is the dominant chamber. The prime minister and Cabinet are responsible solely to the House of Commons and remain in office only so long as they retain the confidence of the House of Commons. The approval of both chambers is necessary for legislation and, thus, the Senate can reject bills passed by the Commons. Between 1867 and 1987, the Senate rejected fewer than two bills per year, but this has increased in more recent years.[when? ][not in citation given] Although legislation can normally be introduced in either chamber, the majority of government bills originate in the House of Commons, with the Senate acting as the chamber of "sober second thought" (as it was called by Sir John A. Macdonald, Canada's first prime minister). The Senate came into existence in 1867, when the Parliament of the United Kingdom passed the British North America Act 1867 (BNA Act), uniting the Province of Canada (which was separated into Quebec and Ontario) with Nova Scotia and New Brunswick into a single federation, a dominion called Canada. The Canadian parliament was based on the Westminster model (that is, the model of the Parliament of the United Kingdom). Canada's first prime minister, Sir John A. Macdonald, described it as a body of "sober second thought" that would curb the "democratic excesses" of the elected House of Commons and provide regional representation. He believed that if the House of Commons properly represented the population, the upper chamber should represent the regions. It was not meant to be more than a revising body or a brake on the House of Commons. Therefore, it was deliberately made an appointed house, since an elected Senate might prove too popular and too powerful and be able to block the will of the House of Commons. The original Senate chamber was lost to the fire that consumed the Parliament Buildings in 1916. Subsequently, the Senate sat in the mineral room of what is today the Canadian Museum of Nature until 1922, when it relocated to Parliament Hill. With the Centre Block undergoing renovations, temporary chambers have been constructed in the Senate of Canada Building, where the Senate began meeting in 2019. Reform of the Senate has been an issue since its creation, and mirrors pre-Confederation debates regarding appointed Legislative Councils in the former colonies. The federal Parliament first considered reform measures in 1874 and the Senate debated reforming itself in 1909. There were minor changes in 1965, when the mandatory retirement age for new Senators was set at 75 years and, in 1982, when the Senate was given a qualified veto over certain constitutional amendments. There have been at least 28 major proposals for constitutional Senate reform since the early 1970s and all have failed. Formal suggestions for equality of seats between provinces occurred in 1981. Schemes to create an elected Senate did not gain widespread support until after 1980, when Parliament enacted the National Energy Program in the wake of the energy crises of the 1970s. Many Western Canadians then called for a "Triple-E Senate", standing for elected, equal, and effective. They believed that allowing equal representation of the provinces, regardless of population, would protect the interests of the smaller provinces and outlying regions. The Meech Lake Accord, a series of constitutional amendments proposed by Prime Minister Brian Mulroney, would have required the federal government to choose a senator from a list of persons nominated by the provincial government; the accord, however, failed to obtain the requisite unanimous consent of the provincial legislatures. Before the failure of the Meech Lake accord, Alberta had passed the Senatorial Selection Act of 1987, which provided for the direct election of Alberta senators. The first of such elections was held in 1989. The results of these elections are non-binding, and only prime ministers Brian Mulroney and Stephen Harper have appointed senators that had won these elections. The Charlottetown Accord, involved a provision under which the Senate would include an equal number of senators from each province, each elected either by the majority in the relevant provincial legislature or by the majority of voters in the province. This accord was defeated in the referendum held in 1992. Prime Minister Stephen Harper was an advocate of an elected Senate, and had said that he would not appoint any new senators until there is reform. In his first two years as prime minister, he appointed two. One of his appointments was Bert Brown, who was one of Alberta's elected nominees and is the second unofficially elected senator in Canadian history after Stan Waters in 1990. Harper appointed a further 57 senators between 2009 and the end of his tenure as prime minister in November 2015. The Cabinet while headed by Prime Minister Stephen Harper moved to institute reforms to the process by which senators would be selected and the amount of time they could hold a seat in parliament. In 2006, Bill S-4 was introduced in the Senate, proposing an amendment to the Constitution Act, 1867, so as to limit the term of a newly appointed senator to eight years, though sitting senators would serve out their term to age 75. In June 2006, Progressive Conservative Senator Lowell Murray and Liberal Senator Jack Austin introduced an amendment to the constitution to alter the makeup of the Senate by enlarging the chamber to 117 members and giving a greater number to the western provinces of British Columbia (12), Alberta (10), Saskatchewan (7), and Manitoba (7). The amendment would also have increased both the number of divisions to five—by separating British Columbia into its own division—and the number of additional senators the monarch could appoint to five or ten. The amendment was debated on June 27 and 28, 2006, and then sent to a special committee on Senate reform. That committee considered the amendment and, on October 26, 2006, endorsed it. Later in the year, Bill C-43, for "the consultation of the electors... in relation to the appointment of senators", was tabled in the House of Commons. It was intended to, pending a constitutional amendment, institute in each province direct elections, held concurrently with either provincial or federal general elections, for senatorial candidates who would then be recommended by the prime minister for appointment by the governor general. Both bills died at the end of the first session of the 39th parliament, but were reintroduced in the second session as C-19 (with modifications) and Bill C-20, respectively. C-19 was reintroduced in 2009 as Bill S-7, with one change: senators appointed between October 14, 2008 and the date the bill was granted Royal Assent would remain senators for eight years after the law came into force. Saskatchewan's new government lead by premier Brad Wall considered running senate nomination elections in Saskatchewan akin to Alberta's, but these plans were ultimately dropped. In December 2006, Conservative Senator David Tkachuk, seconded by Liberal Senator Larry Campbell, proposed an addition to the proposed constitutional changes that would provide for 24 senators for British Columbia. The proposal died on the Order Paper when the writ dropped for the 2008 federal election. Simon Threlkeld, a former Toronto lawyer who writes about democracy, proposed in the National Post that the Senate be chosen by randomly sampled juries of Canadians who meet together face-to-face to make an informed choice after deliberation. He said: "Such a Senate will be independent from political parties, and chosen in a highly democratic, non-partisan and well informed way." The Conservative Party was committed to the idea of elected senatorial candidates being appointed by the governor general on the advice of the prime minister. Accordingly, Prime Minister Stephen Harper in 2007 recommended the appointment of Bert Brown, who was elected in Alberta's Senator in waiting election, but otherwise followed the standing rules in the absence of other elected nominees. Harper later stated that the Senate "must either change or—like the old upper houses of our provinces—vanish". The New Democratic Party (NDP) has consistently called for the Senate's abolition. In 2013, the NDP appeared ambiguous over whether it would appoint Senators if elected to government, although it emphasized its pro-abolition platform. The provincial branches of the NDP follow the same stance as their federal counterpart and the Saskatchewan Party caucus has also voted to support Senate abolition. The Green Party of Canada passed a resolution during its 2010 convention supporting a Senate elected using proportional representation. A private member's bill introduced to by Liberal Member of the Legislative Assembly John Les to the Legislative Assembly of British Columbia on June 2, 2011, with the support of the premier, sought to have elections conducted for BC Senate nominees. The bill was never enacted as law. In January 2014, Liberal leader Justin Trudeau announced that all 32 Liberal senators would no longer be members of the party's caucus. Trudeau announced that, as Prime Minister, he would only appoint future Senators as independents chosen by a non-partisan committee. In response, the Senate caucus chose to designate themselves as "Senate Liberals" and continue their own internal caucus. Under s. 41(e), the abolition of the Senate would require the unanimous consent of the Senate, the House of Commons, and the legislative assemblies of all Canadian provinces, as it would require the removal of the Senate from all aspects of the constitutional amending procedure. Following the ruling, Prime Minister Stephen Harper stated that "Significant reform and abolition are off the table", and many constitutional experts consider abolition to be virtually impossible. In the 2015 general election, the Liberal Party proposed a reform of the process of appointing senators. Within a month of the Liberals under Prime Minister Justin Trudeau being sworn in, in December 2015, the Democratic Institutions Minister Maryam Monsef, with the new House leader Dominic LeBlanc, announced a major overhaul of the appointment process as had been promised during the election campaign. The Independent Advisory Board for Senate Appointments was created as a non-partisan body to review applications of prospective appointees and make recommendations to the prime minister on appointments. Five board members—three federal appointees and two from the provinces—pick independent candidates, not officially affiliated with any political party, based on merit. This reform is in line with Trudeau's January 2014 announcement that began reducing Senate partisanship by making Liberal senators independent and no longer part of the Liberal caucus. The stated goal of the December 2015 reform was to improve the effectiveness of the Senate which had been "hampered by its reputation as a partisan institution", according to Monsef. She indicated that this reform would not require an amendment to the constitution. Only hours later, the Liberal Premier of British Columbia (BC), Christy Clark, stated that her province would not support the changes because they did "not address what's been wrong with the Senate since the beginning". BC is under represented in the Senate, based on population size; BC with 4.7 million people has only six senators, while the Atlantic provinces have 24, although their population is below 2 million. Correcting this imbalance would require a constitutional amendment that is agreed to by seven or more provinces with 50 per cent of the population, and that is unlikely to happen. Clark's other objection was that the senators are appointed, not elected, so they are not accountable to the Canadian public; hence this house should not be legitimized in her estimation. The advisory board was appointed by the end of December 2015. The criteria for appointment to the Senate will be "... outstanding personal qualities that include integrity and ethics and experience in public life, community service or leadership in their field of expertise". As of December 14, there were 22 Senate vacancies. On March 18, 2016, seven new senators, selected under this procedure, were appointed to fill some of the vacancies. On January 19, 2016, the names of the members of the Independent Advisory Board for Senate Appointments was announced. The chair is former deputy minister Huguette Labelle. There will be two other permanent members: McGill University dean of law Daniel Jutras and former University of Alberta president Indira Samarasekera. Two ad hoc members from Manitoba, Quebec and Ontario were also named. This board is to make up a short list of candidates to be considered for the 22 Senate vacancies, based on merit instead of partisan politics. However, the slate of recommended candidates is not binding on the Prime Minister who will make the final decision as to who is appointed. In 2017 it was reported that the independent senators voted with the government 95% of the time, compared to 78% for Liberal Party identified senators. The Senate of Canada and the House of Commons of Canada sit in separate buildings in the Parliamentary Precinct, located in Ottawa, Ontario. The chamber in which the Senate sits is sometimes colloquially known as the Red Chamber, due to the red cloth that adorns the chamber, as well as the Throne. The red Senate chamber is lavishly decorated, in contrast with the more modest, green Commons chamber. This decorative scheme, consistent with the Canadian conception of the Westminster system, is modelled on the British Houses of Parliament, where the Lords chamber is a lavish room with red benches, whereas the Commons chamber is more sparsely decorated and is furnished in green. There are chairs and desks on both sides of the chamber, divided by a centre aisle. The Speaker's chair is at one end of the chamber; in front of it is the Clerk's table. Various clerks sit at the table, ready to advise the Speaker and the senators on procedure when necessary. Members of the governing party sit on the benches to the Speaker's right, while members of the Opposition occupy the benches on the Speaker's left. The first two seats are vacant but present during the regular sitting of the Senate. The Speaker of the Senate uses the third seat with the Arms of Canada. 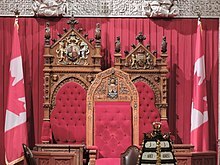 This seat is removed during the throne speech. At either end of the chamber, on the second floor, are the visitors galleries, with total seating in stadium arrangement for 350. The north gallery's lower seating area, or tribune, is reserved for journalists. The Canadian Heraldic Authority on April 15, 2008, granted the Senate, as an institution, a heraldic achievement composed of a depiction of the chamber's mace (representing the monarch's authority in the upper chamber) behind the escutcheon of the Royal Arms of Canada (representing the Queen, in whose name the Senate deliberates). The Governor General is the Queen's representative and holds the power to make normal senatorial appointments, although, in modern practice, the Governor General makes appointments only on the advice of the prime minister. Senators used to hold their seats for life; however, under the British North America Act, 1965 (now known as the Constitution Act, 1965), members, save for those appointed prior to the change, may not sit in the Senate after reaching the age of 75. The last member of the Senate who served past the age of 75 was John Michael Macdonald, who had been appointed on the advice of John Diefenbaker in 1960 and served until his death, at the age of 91 in 1997. Orville Howard Phillips was the last senator appointed for life to leave the body: he was appointed on the advice of Diefenbaker in 1963 and served in the Senate until 1999, when he voluntarily resigned a month before turning 75. While most senators hold their seat until the mandatory age of retirement, Andy Thompson stepped down 20 months ahead of his scheduled retirement after critics drew attention to his poor attendance record while he continued to draw his salary. It was also the first time that the Senate had voted to suspend one of its members, which prompted his resignation shortly afterwards. Under the constitution, each province or territory is entitled to a specific number of Senate seats. The constitution divides Canada into four areas, each with an equal number of senators: 24 for Ontario, 24 for Quebec, 24 for the Maritime provinces (10 each for Nova Scotia and New Brunswick, and four for Prince Edward Island), and 24 for the western provinces (six each for Manitoba, British Columbia, Saskatchewan, and Alberta). Newfoundland and Labrador, which became a province in 1949, is not assigned to any division and is represented by six senators, while the three territories (the Northwest Territories, the Yukon, and Nunavut) are allocated one senator each. Quebec senators are the only ones to be assigned to specific districts within their province. This rule was adopted to ensure that both French- and English-speakers from Quebec were represented appropriately in the Senate. Like most other upper houses worldwide, the Canadian formula does not use representation by population as a primary criterion for member selection, since this is already done for the House of Commons. Rather, the intent when the formula was struck was to achieve a balance of regional interests and to provide a house of "sober second thought" to check the power of the lower house when necessary. Therefore, the most populous province (Ontario) and two western provinces that were not populous at their accession to the federation and that are within a region are under-represented, while the Maritimes are the opposite. For example, British Columbia, with a population of about four million, sends six senators to Ottawa, whereas, Nova Scotia and New Brunswick, with populations of fewer than one million, are each entitled to 10 senators. Only Quebec has a share of senators approximate to its share of the total population. For comparison, Canada has roughly one senator for about 300,000 citizens, while the United States Senate has one elected senator for about three million citizens. Note: Population data based on the latest official 2016 Canadian Census, conducted and published by Statistics Canada. There exists a constitutional provision—Section 26 of the Constitution Act, 1867—under which the sovereign may approve the appointment of four or eight extra senators, equally divided among the four regions. The approval is given by the monarch on the advice of the prime minister, and the governor general is instructed to issue the necessary letters patent. This provision has been used only once: in 1990, when Prime Minister Brian Mulroney sought to ensure the passage of a bill creating the Goods and Services Tax (GST). The appointment of eight additional senators allowed a slight majority for the Progressive Conservative Party. There was one unsuccessful attempt to use Section 26, by Prime Minister Alexander Mackenzie in 1874. It was denied by Queen Victoria, on the advice of the British Cabinet. The invocation of Section 26 does not oblige the Governor General to appoint four or eight senators—it could theoretically be used to appoint just a single extra senator (for example, the representation of a senator under 75 who has been permanently incapacitated could be replaced by invoking Section 26 without the need to appoint senators from other regions) although the clause has never been used in such a manner. Also, this clause does not result in a permanent increase in the number of Senate seats, however. Instead, an attrition process is applied by which senators leaving office through normal means are not replaced until after their province has returned to its normal number of seats. Since 1989, the voters of Alberta have elected "senators-in-waiting", or nominees for the province's Senate seats. These elections, however, are not held pursuant to any federal constitutional or legal provision; thus, the prime minister is not required to recommend the nominees for appointment. Only three senators-in-waiting have been appointed to the Senate: the first was Stan Waters, who was appointed in 1990 on the recommendation of Brian Mulroney; the second was Bert Brown, elected a Senator-in-waiting in 1998 and 2004, and appointed to the Senate in 2007 on the recommendation of Prime Minister Stephen Harper; and the third was Betty Unger, elected in 2004 and appointed in 2012. The base annual salary of a senator was C$150,600 in 2019. and members may receive additional salaries in right of other offices they hold (for instance, the title of Speaker). Most senators rank immediately above Members of Parliament in the order of precedence, although the Speaker is ranked just above the Speaker of the House of Commons and both are a few ranks higher than the remaining senators. The Constitution Act, 1867 outlines the qualifications of senators. Individuals must be both citizens of Canada and at least 30 years of age to be eligible for appointment to the Senate. Senators must also maintain residency in the provinces or territories for which they are appointed. In the past, this criterion has often been interpreted quite liberally, with virtually any holding that met the property qualification, including primary residences, second residences, summer homes, investment properties or even lots of undeveloped land, having been deemed to meet the residency requirement; as long as the senator listed a qualifying property as a residence, no further efforts have typically been undertaken to verify whether they actually resided there in any meaningful way. Residency has come under increased scrutiny, particularly in 2013 as several senators have faced allegations of irregularities in their housing expense claims. ceases to be qualified in respect of property or of residence (except where required to stay in Ottawa because they hold a government office). S. 33 of the Act provides for the Senate to determine any questions of qualification or vacancy. ^ a b On January 29, 2014, Liberal Party leader Justin Trudeau announced all Liberal senators had been removed from the Liberal caucus and would henceforth sit as independents. The senators refer to themselves as the Senate Liberal Caucus and continue to meet together, but are no longer members of the parliamentary Liberal caucus. Senate rules and publications also continue to identify the senators as Liberals. ^ The ISG was recognized as a parliamentary group on December 2, 2016 and given equal standing to the two partisan caucuses on May 17, 2017. There is some debate as to whether there is any requirement for the Prime Minister to advise the governor general to appoint new senators to fill vacancies as they arise. Then-Opposition leader Tom Mulcair argued that there is no constitutional requirement to fill vacancies. Constitutional scholar Peter Hogg has commented that the courts "might be tempted to grant a remedy" if the refusal to recommend appointments caused the Senate to be diminished to such a degree that it could not do its work or serve its constitutional function. Vancouver lawyer Aniz Alani filed an application for judicial review of then-Prime Minister Stephen Harper's apparent refusal to advise the appointment of senators to fill existing vacancies, arguing that the failure to do so violates the Constitution Act, 1867. On July 24, 2015, Harper announced that he would not be advising the governor general to fill the 22 vacancies in the Senate, preferring that the provinces "come up with a plan of comprehensive reform or to conclude that the only way to deal with the status quo is abolition". He declined to say how long he would allow vacancies to accumulate. Under Canada's constitution, senators are appointed by the governor general on the advice of the Prime Minister. If no such advice is forthcoming, according to constitutional scholar Adam Dodek, in "extreme cases, there is no question that the Governor General would be forced to exercise such power [of appointment] without advice". On December 5, 2015, the new Liberal government announced a new merit-based appointment process, using specific new criteria as to eligibility for the Senate. Independent applicants, not affiliated with any political party, will be approved by a new five-member advisory board (to be in place by year end), a reform that was intended to begin eliminating the partisan nature of the Senate. At the time, there were 22 vacancies in the Senate. On April 12, 2016, seven new senators were sworn in, including Prime Minister Justin Trudeau's hand picked Representative of the Government in the Senate, Hon. Peter Harder. A series of additional appointments were announced for October and November 2016 that would fill all vacancies. Once these senators are summoned, the independent non-aligned senators became more numerous than either of the party caucuses for the first time in the Upper House's history. The independant senator group also grew to include over half the total number of senators. On December 12, 2018, the four remaining vacancies were filled in Nova Scotia, the Yukon, the Northwest Territories and Ontario. With these appointments, the Senate had a full complement of Senators for the first time in over eight years. The Speaker presides over sittings of the Senate and controls debates by calling on members to speak. If a senator believes that a rule (or standing order) has been breached, he or she may raise a point of order, on which the Speaker makes a ruling. However, the Speaker's decisions are subject to appeal to the whole Senate. When presiding, the Speaker remains impartial, though he or she still maintains membership in a political party. Unlike the Speaker of the House of Commons, the Speaker of the Senate does not hold a casting vote, but, instead, retains the right to vote in the same manner as any other. As of the 42nd Parliament, beginning on December 2015, Senator George Furey presides as Speaker of the Senate. The senator responsible for steering legislation through the Senate is the Representative of the Government in the Senate, who is a senator selected by the prime minister and whose role is to introduce legislation on behalf of the government. The position was created in 2016 to replace the former position of Leader of the Government in the Senate. The opposition equivalent is the Leader of the Opposition in the Senate, who is selected by his or her counterpart in the House of Commons, the Leader of the Opposition. However, if the Official Opposition in the Commons is a different party than the Official Opposition in the Senate (as was the case from 2011 to 2015), then the Senate party chooses its own leader. The Senate chamber is the site of the opening of parliament, a formal ceremony held at the beginning of each new parliamentary session. During the event, the Sovereign or the governor general, seated on the throne in the Senate chamber and in the presence of both Houses of Parliament, delivers the Speech from the Throne (or, more colloquially, the throne speech), outlining the government's agenda for the upcoming parliamentary session. Under the rules of the Senate, the Senate sits Mondays to Fridays. Sittings of the Senate are open to the public and are transcribed verbatim in the Debates of the Senate, although, at times, matters of particular interest have been broadcast. The Constitution Act, 1867, establishes a quorum of 15 Members (including the Member presiding) for the Senate. Any senator may request the Speaker to ascertain the presence of a quorum; if it does not appear that one is present, the Speaker orders bells to be rung, so that other senators on the parliamentary precincts may come to the chamber. If a quorum still does not appear, the Speaker must adjourn the Senate until the next sitting day. Speeches may be made in either of Canada's official languages (English or French). Members must address their speeches to the other senators as a whole, using the phrase "Honourable Senators" (Honorables Sénateurs), without directly addressing an individual senator. This is similar to the process in the House of Lords, where all speeches and comments are addressed to "my lords". It differs slightly from the practice in the Canadian House of Commons and similar bodies in other countries, where all comments are addressed to the Speaker of the House. The Speaker enforces the rules of the Senate during debate. Disregarding the Speaker's instructions is considered a severe breach of the rules of the Senate. No senator may speak more than once on the same question; however, a senator who has moved a substantive motion, proposed an inquiry, or sponsored a bill holds a right of reply that enables them to speak again at the close of debate. In the case of a bill, this right of reply can only be exercised at the second reading debate. The rules of the Senate prescribe time limits for speeches. The limits depend on the nature of the motion, but are generally about fifteen minutes. However, the leaders of the government and opposition in the Senate are not subject to such time constraints. Debate may be further restricted by the passage of time allocation motions. Alternatively, the Senate may end debate more quickly by passing a motion for the previous question. If such a motion carries, debate ends immediately and the Senate proceeds to vote. Debate may also end if no senator wishes to make any further remarks. When the debate concludes, the motion in question is put to a vote. The first voting action by the Senate is by voice vote; the presiding officer reads the question and members respond either "yea" (in favour of the motion) or "nay" (against the motion). The presiding officer then announces the result of the voice vote, but, two or more senators may challenge this assessment, thereby forcing a recorded vote (known as a division). First, members in favour of the motion rise, so that the clerks may record their names and votes. The same procedure is repeated for members who oppose the motion and once again for those who abstain. In all cases, the Speaker holds a vote (which is not usually exercised) and votes first when a recorded division is called; a tied vote results in the motion's failure. If the number of members voting, including the presiding officer, does not at least total 15, then a quorum is not present, and the vote is invalid. The Parliament of Canada uses committees for a variety of purposes. Committees consider bills in detail and can make amendments. Other committees scrutinize various government agencies and ministries. The largest of the Senate committees is the Committee of the Whole, which, as the name suggests, consists of all senators. The Committee of the Whole meets in the chamber of the Senate, but proceeds under slightly modified rules of debate. (For example, there is no limit on the number of speeches a Member may make on a particular motion.) The presiding officer is known as the chairman. The Senate may resolve itself into a Committee of the Whole for a number of purposes, including to consider legislation or to hear testimony from individuals. Nominees to be officers of parliament often appear before Committee of the Whole to answer questions with respect to their qualifications prior to their appointment. The Senate also has several standing committees, each of which has responsibility for a particular area of government (for example, finance or transport). These committees consider legislation and conduct special studies on issues referred to them by the Senate and may hold hearings, collect evidence, and report their findings to the Senate. Standing committees consist of between nine and fifteen members each and elect their own chairmen. Special committees are appointed by the Senate on an ad hoc basis to consider a particular issue. The number of members for a special committee varies, but, the partisan composition would roughly reflect the strength of the parties in the whole Senate. These committees have been struck to study bills (e.g., the Special Senate Committee on Bill C-36 (the Anti-terrorism Act), 2001) or particular issues of concern (e.g., the Special Senate Committee on Illegal Drugs). Other committees include joint committees, which include both members of the House of Commons and senators. There are currently two joint committees: the Standing Joint Committee on the Scrutiny of Regulations, which considers delegated legislation, and the Standing Joint Committee on the Library of Parliament, which advises the two Speakers on the management of the library. Parliament may also establish special joint committees on an ad hoc basis to consider issues of particular interest or importance. Although legislation may be introduced in either chamber, most bills originate in the House of Commons. Because the Senate's schedule for debate is more flexible than that of the House of Commons, the government will sometimes introduce particularly complex legislation in the Senate first. In conformity with the British model, the Senate is not permitted to originate bills imposing taxes or appropriating public funds. Unlike in Britain but similar to the United States, this restriction on the power of the Senate is not merely a matter of convention but is explicitly stated in the Constitution Act, 1867. In addition, the House of Commons may, in effect, override the Senate's refusal to approve an amendment to the Canadian constitution; however, they must wait at least 180 days before exercising this override. Other than these two exceptions, the power of the two Houses of Parliament is theoretically equal; the approval of each is necessary for a bill's passage. In practice, however, the House of Commons is the dominant chamber of parliament, with the Senate very rarely exercising its powers in a manner that opposes the will of the democratically elected chamber. Although the Senate has not vetoed a bill from the House of Commons since 1939, minor changes proposed by the Senate to a bill are usually accepted by the House. The Senate tends to be less partisan and confrontational than the Commons and is more likely to come to a consensus on issues. It also often has more opportunity to study proposed bills in detail either as a whole or in committees. This careful review process is why the Senate is still today called the chamber of "sober second thought", though the term has a slightly different meaning than it did when used by John A. Macdonald. The format of the Senate allows it to make many small improvements to legislation before its final reading. The Senate, at times, is more active at reviewing, amending, and even rejecting legislation. In the first 60 years after Confederation, approximately 180 bills were passed by the House of Commons and sent to the Senate that subsequently did not receive Royal Assent, either because they were rejected by the Senate or were passed by the Senate with amendments that were not accepted by the Commons. In contrast, fewer than one-quarter of that number of bills were lost for similar reasons in the sixty-year period from 1928 to 1987. [not in citation given] The late 1980s and early 1990s was a period of contention. During this period, the Senate opposed legislation on issues such as the 1988 free trade bill with the US (forcing the Canadian federal election of 1988) and the Goods and Services Tax (GST). In the 1990s, the Senate rejected four pieces of legislation: a bill passed by the Commons restricting abortion (C-43), a proposal to streamline federal agencies (C-93), a bill to redevelop the Lester B. Pearson airport (C-28), and a bill on profiting from authorship as it relates to crime (C-220). In December 2010, the Senate rejected Bill C-311, involving greenhouse gas regulation that would have committed Canada to a 25% reduction in emissions by 2020 and an 80% reduction by 2050. The bill was passed by all the parties except the Conservatives in the House of Commons and was rejected by the majority Conservatives in the Senate on a vote of 43 to 32. The only session where actual debate on the bill took place was notable for unparliamentary language and partisan political rhetoric. Historically, before the passage of the Divorce Act in 1968, there was no divorce legislation in either Quebec or Newfoundland. The only way for couples to get divorced in these provinces was to apply to the federal parliament for a private bill of divorce. These bills were primarily handled by the Senate, where a special committee would undertake an investigation of a request for a divorce. If the committee found that the request had merit, the marriage would be dissolved by an Act of Parliament. A similar situation existed in Ontario before 1930. This function of the Senate has not been exercised since 1968. Unlike the House of Commons, the Senate has no effect in the decision to end the term of the prime minister or of the government. Only the Commons may force the prime minister to tender his resignation or to recommend the dissolution of Parliament and issue election writs, by passing a motion of no-confidence or by withdrawing supply. Thus, the Senate's oversight of the government is limited. The Senate does however approve the appointment of certain officials and approves the removal of certain officials, in some cases only for cause, and sometimes in conjunction with the House of Commons, usually as a recommendation from the Governor in Council. Officers in this category include the Auditor General of Canada, and the Senate must join in the resolution to remove the Chief Electoral Officer of Canada. Most Cabinet ministers are from the House of Commons. In particular, every prime minister has been a member of the House of Commons since 1896, with the exception of John Turner. Typically, the Cabinet includes only one senator: the Leader of the Government in the Senate. Occasionally, when the governing party does not include any members from a particular region, senators are appointed to ministerial positions in order to maintain regional balance in the Cabinet. The most recent example of this was on February 6, 2006, when Stephen Harper advised that Michael Fortier be appointed to serve as both a senator representing the Montreal region, where the minority government had no elected representation, and the Cabinet position of Minister of Public Works and Government Services. Fortier resigned his Senate seat to run (unsuccessfully) for a House of Commons seat in the 2008 general election. Unlike the House of Commons, proceedings of the Senate were historically not carried by CPAC, as the upper house long declined to allow its sessions to be televised. On April 25, 2006, Senator Hugh Segal moved that the proceedings of the Senate be televised; the motion was referred to the Senate Standing Committee on Rules, Procedures and the Rights of Parliament for consideration; although the motion was approved in principle, broadcast of senate proceedings was not actually launched at that time apart from selected committee meetings. Full broadcast of Senate proceedings launched for the first time on March 18, 2019, concurrently with the Senate's temporary relocation to the Senate of Canada Building. Outside of Parliament Hill, most senators have offices in the Victoria Building across Wellington Street. ^ a b c Guida, Franco (2006). Canadian almanac & directory (159th ed.). Micromedia ProQuest. pp. 3–42. ISBN 1-895021-90-1. ^ a b c d e "THE CANADIAN SENATE IN FOCUS 1867–2001". The Senate of Canada. May 2001. Retrieved August 4, 2007. ^ "FAQs about the Senate of Canada". Government of Canada. 2015. Retrieved December 7, 2015. ^ "The Canadian Senate in Focus". Parl.gc.ca. Retrieved July 1, 2010. ^ "How to legitimize Canada's Senate". Retrieved August 19, 2015. ^ Jack Stillborn (November 1992). "Senate Reform Proposals in Comparative Perspective" (PDF). Library of Parliament. Archived from the original (PDF) on June 30, 2007. Retrieved March 18, 2007. ^ a b Joyal, Serge (July 2003). Protecting Canadian Democracy: The Senate You Never Knew. McGill-Queen's University Press. ISBN 978-0-7735-2619-8. Archived from the original on July 16, 2007. ^ Makarenko, Jay (October 1, 2006). "Senate Reform in Canada". MapleLeafWeb. Retrieved November 24, 2008. ^ a b Curry, Bill; Brian Laghli (May 19, 2008). "Saskatchewan plans to elect senators". The Globe and Mail. Archived from the original on January 16, 2009. Retrieved November 24, 2008. ^ Yaffe, Barbara (June 22, 2008). "Move for an elected Senate will take time and patience". The Montreal Gazette. Canwest News Service. Archived from the original on September 23, 2009. Retrieved November 28, 2008. ^ CTV.ca News Staff (May 30, 2006). "Tories to propose fixed terms for new senators". CTV.ca. Retrieved December 3, 2006. ^ Government of Canada (June 22, 2006). "Amendment to the Constitution of Canada—Western Provincial Representation". Debates of the Senate: 1st Session, 39th Parliament. Library of Parliament. Retrieved December 3, 2006. ^ a b "Canadians will choose senators under new bill". CBC news. December 13, 2006. Retrieved November 8, 2007. ^ "Bill C-43: An Act to provide for consultations with electors on their preferences for appointments to the Senate". ^ "Bill C-19: An Act to amend the Constitution Act, 1867 (Senate tenure)". Archived from the original on March 17, 2008. ^ "Bill C-20: Senate Appointment Consultations Act". Archived from the original on March 17, 2008. ^ "Text of Bill S-7, An Act to amend the Constitution Act, 1867". ^ Threlkeld, Simon (September 14, 2015). "Select senators by jury". National Post. ^ CBC News (April 18, 2007). "Harper appoints Albertan senator-in-waiting". CBC. Canada. Retrieved April 19, 2007. ^ Campion-Smith, Bruce (December 11, 2008). "Harper set to name 18 to Senate". The Star. Toronto. Retrieved May 23, 2010. ^ CTV News (September 12, 2008). "Harper to fill 18 Senate seats with Tory loyalists". Ctv.ca. ^ MacCharles, Tonda; Campion-Smith, Bruce (December 22, 2008). "Duffy, Wallin named to Senate". The Star. Toronto. Retrieved May 23, 2010. ^ CBC News (September 11, 2007). "Senate should vanish if it's not reformed: Harper". CBC. Canada. Retrieved April 26, 2014. ^ "CBC News – Canada – Dallaire, Eggleton among nine new senators". CBC. Canada. March 24, 2005. Retrieved July 1, 2010. ^ "Tom Mulcair ambiguous if he will appoint NDP senators if party wins next election". National Post. Canada. October 14, 2013. ^ "Saskatchewan premier Wall no longer believes Senate can be reformed". Star Phoenix. Canada. Canadian Press. May 24, 2013. Archived from the original on June 30, 2013. Retrieved July 9, 2013. ^ CBC News (July 8, 2013). "Sask. Party members vote to abolish senate". CBC. Canada. Retrieved July 9, 2013. ^ "Senate Reform – Green Party of Canada". greenparty.ca. ^ "Every Liberal Senator Booted From Caucus As Trudeau Aims To Restore Independence". Huffington Post. The Canadian Press. Retrieved January 29, 2014. ^ Smith, Joanna (September 9, 2015). "What to do about the Senate?". Toronto Star. ^ Harris, Kathleen (December 3, 2015). "Liberal plan to pick 'non-partisan' senators draws quick criticism B.C. Premier Christy Clark slams reforms". CBC News. CBC/Radio Canada. Retrieved December 4, 2015. ^ a b Galloway, Gloria (December 3, 2015). "Liberals to set up advisory board for Senate nominees, but B.C. won't take part". Globe and Mail. Toronto, Ontario, Canada. Retrieved December 4, 2015. ^ Bryden, Joan (December 6, 2015). "Trudeau's reforms do nothing to improve Senate's legitimacy, Christy Clark says". Globe and Mail. Toronto, Ontario, Canada. Retrieved December 7, 2015. ^ Baldrey, Keith (December 3, 2015). "Why Christy Clark is rejecting Justin Trudeau's reform of the Senate". Global News. Shaw Media Inc. Retrieved December 4, 2015. ^ Coyne, Andrew (December 14, 2015). "Andrew Coyne: Who asked for this kind of Senate reform?". National Post. Toronto, Ontario. Retrieved December 15, 2015. ^ Smith, Joanna (December 3, 2015). "Liberals set up non-partisan, merit-based process for choosing new senators". Toronto Star. Toronto, Ontario, Canada. Retrieved December 4, 2015. ^ "Chantal Peticlerc, Murray Sinclair among 7 new Trudeau-appointed senators". CBC. CBC News. March 18, 2016. Retrieved March 18, 2016. ^ "Two Manitoba MPs appointed to senate advisory committee". CTV Winnipeg. The Canadian Press. January 19, 2016. Retrieved January 19, 2016. ^ Tasker, John Paul (January 19, 2016). "Senate advisory board named, 1st appointments expected within weeks". CBC News. CBC/Radio Canada. Retrieved January 19, 2016. The board will consult with labour groups, chambers of commerce and the arts community to suggest a short list of five individuals for each vacancy. ^ Canada, Senate of (April 25, 2016). "Senate of Canada – About the Senate". Senate of Canada. ^ Canadian Heraldic Authority. "Public Register of Arms, Flags and Badges of Canada > Senate of Canada". Queen's Printer for Canada. Retrieved August 8, 2010. ^ "www2.parl.gc.ca". .parl.gc.ca. Retrieved January 10, 2011. ^ "Senate votes to suspend Andrew Thompson". CBC. November 13, 1998. Retrieved April 28, 2008. ^ Canada, Government of Canada, Statistics. "Population – Canada at a Glance, 2018". www150.statcan.gc.ca. Retrieved October 11, 2018. ^ W.H. McConnell, Commentary on the British North America Act (Toronto: McMillan & Co., 1977), pp. 72–73. ^ "Harper appoints 7 new senators". CBC News. January 6, 2012. ^ "Indemnities, Salaries and Allowances". Parliament of Canada. Library of Parliament. Retrieved July 27, 2015. ^ a b "Senator says she won't talk more about Sask. residency". CBC News. February 17, 2009. ^ "Senators ordered to provide concrete proof of primary residence". Ottawa Citizen. January 31, 2013. Archived from the original on February 4, 2013. ^ a b staff reporter (April 1998). "Canada's Upper House: Do We Need the Senate? – Constitutional Origins". Canadian Broadcasting Corporation. Archived from the original on October 16, 2007. Retrieved February 12, 2008. But having taken a vow of poverty 40 years ago, she lacked the necessary $4000 in 'real and personal property' that is stipulated in Section 23 of the Constitution Act of 1867. Upon this realization, the scramble was on to ensure her appointment, and a small parcel of land was transferred by her Montreal-based order into her name. ^ Tasker, John Paul (May 17, 2017). "Senate changes definition of a 'caucus,' ending Liberal, Conservative duopoly". CBC News. Retrieved November 6, 2017. ^ – "Stephen Harper obliged to fill empty Senate seats?". CBC News. July 10, 2014. Retrieved December 10, 2014. ^ – "Stephen Harper's unappointed Senate seats unconstitutional, Vancouver lawyer says". CBC News. December 15, 2014. Retrieved December 18, 2014. ^ Steven Chase, "Harper will not appoint more senators", The Globe and Mail. July 25, 2015. ^ Adam Dodek, "PM's constitutional disobedience a dangerous game to play", The Globe and Mail, July 28, 2015. ^ Tasker, John Paul (December 12, 2018). "Trudeau names four new senators – including a failed Liberal candidate". CBC News. ^ "The Speaker of the Senate: Role and Appointment". Government of Canada. 2017. Retrieved March 9, 2018. ^ "Rules of the Senate, Chapter 3: Sittings of the Senate". Parliament of Canada. Retrieved March 4, 2018. ^ "Senate – Committee List". Parl.gc.ca. Retrieved July 1, 2010. ^ "Senate – Committee Home Page". Parl.gc.ca. Retrieved July 1, 2010. ^ Foot, Richard. "Senate of Canada". ^ Gibson, Gordon (September 2004). "Challenges in Senate Reform: Conflicts of Interest, Unintended Consequences, New Possibilities". Public Policy Sources. Fraser Institute. Archived from the original on June 9, 2007. Retrieved August 4, 2007. ^ "Mulroney-era cabinet documents reveal struggle to replace abortion law thrown out by court". Toronto Star. ^ "Concentration of Newspaper Ownership". Canadian Heritage. Retrieved November 17, 2007. ^ Edge, Marc (November 13, 2007). "Aspers and Harper, A Toried Love". The Tyee. Retrieved November 17, 2007. ^ "Concentration of Newspaper Ownership". Standing Senate Committee on Transport and Communications. June 2006. Retrieved November 17, 2007. ^ "House of Commons bills sent to the Senate that did not receive Royal Assent". parl.gc.ca. November 16, 2010. Archived from the original on April 20, 2015. Retrieved April 7, 2014. ^ "Senate vote to kill Climate Act disrespects Canadians and democracy". davidsuzuki.org. October 19, 2010. Archived from the original on May 3, 2011. Retrieved May 9, 2011. ^ "Debates of the Senate, November 16, 2010". Senate of Canada. ^ "Debates of the Senate, June 1, 2010". Senate of Canada. ^ "Segal calls for televised Senate: Kingston politician wants body to be accountable". Kingston Whig-Standard, April 8, 2006. ^ a b "Senate expected to start regular TV broadcasts after move to Government Conference Centre". iPolitics, March 10, 2018. ^ "Ready for their closeup: Senate begins broadcasting proceedings for first time today". CBC News, March 18, 2019. Wikimedia Commons has media related to Senate of Canada. Look up red chamber in Wiktionary, the free dictionary. Forsey, Eugene. (2003). "How Canadians Govern Themselves."